HUNTING ICE. 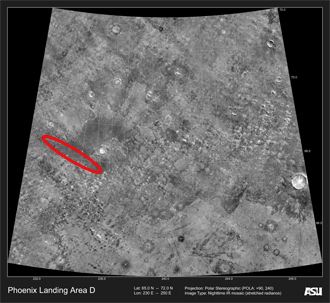 Seen against a nighttime infrared THEMIS image, a red oval marks the Phoenix landing area near 68 degrees north latitude and 233 degrees east longitude. Lighter shades of gray indicate warmer and rockier ground. Scientists suspect ice lies just a few inches below the soil surface. Scientists at Arizona State University's Mars Space Flight Facility used the Thermal Emission Imaging System on NASA's Mars Odyssey orbiter to help choose a safe landing site for the Phoenix Mars spacecraft. This mission, built under NASA's Mars Scout program, launched in August 2007 and will land in May 2008. The goal of Phoenix is to set down at a high northern latitude, where water ice is suspected to lie just under a thin, dry layer of soil. Phoenix, a non-roving lander, will use its robot arm to scrape away the soil and collect a small sample of ice for analysis by its instruments. THEMIS has provided Phoenix project scientists with nighttime infrared images of candidate landing sites. The images show areas of warm ground which appear strewn with large boulders that could destroy Phoenix on touchdown. By avoiding the warm areas, mission controllers can choose landing sites that are safe.